Gumi (Hangul: 구미; Korean pronunciation: [ku.mi]) is the second largest city in Gyeongsangbuk-do, South Korea. It is located on the Nakdong River, halfway between Daegu and Gimcheon, also lies on the Gyeongbu Expressway and Gyeongbu Line railway which are the principal traffic routes of the country. The city is an industrial center of the country with many companies, including Samsung Electronics and LG Display, having a manufacturing presence there. The primary industries are electronics, textiles, fibers, rubber, plastic and metal products. In Gumi, 1,772 companies employ over 80,000 workers. It is the largest scale in Korea. In 2009, the city exported the largest amount in the country and accounted for 96.9% of trade surplus of Korea in 2000 to 2009. The former President of South Korea, Park Chung-hee, was born in the city. In the Three Kingdoms period, Gumi was part of the territory of the Silla Kingdom. The first Silla temple, Dori Temple, was constructed here. More recently, the town was the birthplace of the South Korean president Park Chung-Hee. Not coincidentally, it was during his administration that the South Korean government selected Gumi as a site for major industrial development. His birth home is a museum today. Gumi developed rapidly during the 1960s, growing from a small rural town into a large city thanks to huge infusions of development money from the government. It was selected for development for some practical reasons such as its easy access to transportation infrastructure, and its location in the industrialized Yeongnam region. The city center of Gumi is divided into 19 dong, or neighborhood units. The hinterland is divided into 6 myeon, or rural areas, and 2 eup, or large villages: Seonsan-eup and Goa-eup. Famous people from Gumi include former South Korean president Park Chung-hee, his daughter Park Geun-hye, singer and I Am A Singer 4 finalist Hwang Chi-yeul, former H.O.T. member Jang Woo-hyuk, singer and g.o.d member Kim Tae-woo, e-sports player Lee Yun-Yeol-known as "Genius Terran", girl group member AOA's Kim Chanmi, and Kim Hyo Suk who obtained her doctoral degree in Art Therapy as the first person in Korea, as well as Ju Hyung Ahn, a world-renowned expert. Population: At present, the population of Gumi is 427,770 (as of February 19). Gumi is the homeground for the KB Insurance Stars volleyball team ( Korean volleyball league). The team's home stadium is Park Chung-hee Stadium, which is located in the neighbourhood of Gwangpyeong-dong. The Doesan Cave, Daehye Waterfall and HaeUn Buddhist Temple are easily reached by taking the cable car from the entrance of the park and a short hike. Doesan Cave named after the Buddhist monk Doesan who attained a state of nirvana in the cave. He was a master of the theory of "divination based on topography" in the later Shilla dynasty. Daehye Waterfall is 27 m high and is especially beautiful during the rainy season when there is a lot of water flowing over it. It can be completely dry during periods without rain and is frozen in winter. The HaeUn Buddhist Temple is also near the top of the cable car route. The YakSa Temple and the Ma Ae cliff Buddha statue are both near the summit of Geumo Mountain and require about 1 – 2 hours of hiking to reach them. The YakSa Temple is an active Buddhist temple and is said to have been created to commemorate Saint Ulsang's attainment of nirvana. It sit near the peak of the mountain and can be reached both from the peak and by a trail from the bottom. It has a unique bell that sits on a separate spike of rock connected by a suspension bridge. The Ma Ae Cliff Buddha (National Treasure #490) is carved into the corner of a cliff face thought to have been carved during the Goryeo dynasty. On September 27, 2012 workers at the Hube Global plant in Gumi were unloading hydrofluoric acid (HF) from a tanker when an explosion occurred causing about 8 tonnes of the acid to leak into the surrounding area. The leak caused 5 deaths initially and prompted more than 3000 people to seek medical attention at local hospitals. Local rice and grape crops were ruined because the acid caused them to wither. Approximately 3,200 livestock were exposed. The acid, which can etch glass and is used in the electronics industry, caused damage to at least 1,000 vehicles. Total damage costs as of October 10, 2012 were about 16 million USD. ^ 국내 무역 흑자액 97%는 구미공단 몫. 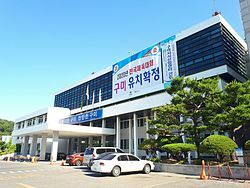 ^ "Kim Hyo Suk receive her degree from Yeongnam College on the 22nd of next month". News. Retrieved 2015-12-09. ^ "KOSIS". kosis.kr. Retrieved 2019-03-28. ^ KB Insurance Stars vollevball team, KB Insurance Stars vollevball team (2016-04-29). "KB Insurance Stars vollevball team". Archived from the original on 2015-06-26. ^ "S Korea leak area 'disaster zone'". 8 October 2012 – via www.bbc.co.uk. ^ "Questions remain after huge hydrofluoric acid leak - News - Chemistry World". ^ CNN, By K.J. Kwon,. "Toxic leak in South Korea sickens thousands, ruins crops - CNN". ^ 평년값자료(1981–2010) 구미(279). Korea Meteorological Administration. Retrieved 2011-05-21. Wikimedia Commons has media related to Gumi.